Like a true Gaucho, Geivett did not let his shortcomings take control of his life. When faced with adversity he did not find excuses but instead found ways to succeed and win. 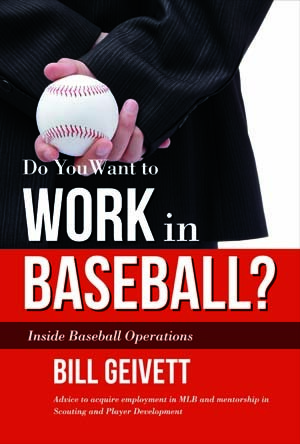 Gaucho alum Bill Geivett recently released his book, Do You Want to Work in Baseball? Inside Baseball Operations, which details his experiences in professional baseball as a player, scout, farm director and front-office executive. In the publication, Geivett’s advice is not only applicable to those who seek a career in sports management, but to anyone competing in any type of job market today as well. Geivett played for the Gauchos in 1984 and 1985 and posted monster numbers while in a UCSB uniform. Geivett still holds the school records for career batting average (.402), single season batting average (.412, 1985), hits in a season (100, 1985). He also used to hold records for triples in a season (8, 1985), most runs scored in a season (74, 1985), and most at-bats in a single season (243, 1985). After previously being drafted four consecutive times by four different organizations, Geivett finally signed with then Anaheim Angels organization in 1985 after being drafted in the 13th round. Unfortunately for Geivett, his baseball-playing career would come to a sudden conclusion due to a knee injury in 1988, but this career ending injury still would not stop Geivett from being a part of baseball. Soon after, Geivett would coach for Loyola Marymount University in 1989 and Long Beach State University in 1990. While coaching for college programs added to his already impressive baseball resume, Geivett’s future would still lie in professional baseball with him eventually becoming a scout and instructor in the Yankees organization in 1991. From 1994 to 1996, Geivett would be hired as the head farm director for the Montreal Expos. The Expos’ farm system was largely known as one of the best farm systems in baseball during this time due to the tremendous talent in the system that housed big names such as Mark Grudzielanek, Orlando Cabrera, Jose Vidro, Cliff Floyd and Vladimir Guerrero. During his time as a farm director, in his book, Geivett recalls an experience he had with a particular player, F.P. Santangelo. This angered many Ottawa Lynx players, but no more so than it angered Santangelo. After a team meeting, most players had cooled down — but not Santangelo. Santangelo would confront Geivett and insist he is ready to be called up to the big leagues, even though Santangelo was hitting a less than impressive .243 at the time. After a roster spot opened up on the big league squad due to an injury, Geivett would take a risk on Santangelo, sending him to the big leagues after Santangelo waited seven years in the minors. Stating he went above several people’s heads in the organization to do this in his memoir, Geivett’s career was on the line with this decision. Nervous, Geivett’s worst fear would come true and Santangelo’s name would be penciled in the lineup the first day he arrived in Montreal. Putting all his money on Santangelo, a person who was more confident in his ability than anyone, Geivett would come out on top. After his time in Montreal, Geivett would become the assistant general manager of the Devil Rays in 1997 and would move on to join the Dodgers in 1998 under the same position. While with the Dodgers, Geivett shared another story about college graduates looking for work in professional baseball. At the Baseball Winter Meetings, an event where baseball GMs meet and discuss potential trades, a couple college graduates approached Geivett and Tommy Lasorda with their resumes trying to get hired on the spot for jobs within the organization. Right then and there, both Geivett and Lasorda broke down the flaws in each approach the men had … to their faces. In 2000, Geivett would land and stick with the Colorado Rockies organization for 14 years, moving from director of player personnel to director of minor league operations to assistant general manager to the team’s director of major-league operations in 2012. After a long career in baseball, Geivett would later resign from this position in 2014.